NEW ORLEANS – The 2017 NCAA Division III Cross Country Championships might be more than two months away, but teams are sure jockeying for position in the Men’s National Coaches’ Poll. Twenty eight of the 35 teams in the most recent poll released Wednesday by the U.S. Track & Field and Cross Country Coaches Association (USTFCCCA) moved places since the preseason. Nothing changed up top as North Central (Ill.) is still the unanimous No. 1, having received all eight first-place votes from the coaches. The Cardinals notched victories in the past three meets, including the Illinois State Country Financial Invitational this past weekend where they put six in the top-10 and toppled several NCAA Division I programs. SUNY Geneseo, UW-La Crosse and Williams once again sit in order behind North Central (Ill.). The Ephs gained ground on the Knights and Eagles, though, as their point total is now 258 compared to 252 from the preseason. Coming in at No. 5 in Week 1 is Johns Hopkins. This marks the best ranking in program history for the Blue Jays as they eclipsed their previous best of No. 7. Johns Hopkins made a statement at the Mustang Stampede this past weekend as it scored 15 points and sent 11 runners across the finish line before the next collegiate athlete. Haverford also soared as it went from No. 14 to No. 8, which is its best ranking since 2015. The Fords settled in right behind No. 6 MIT and No. 7 UW-Eau Claire, while it knocked previous No. 8 Christopher Newport to No. 9 and previous No. 9 Loras to No. 10. Calvin is No. 12 after starting the season at No. 15. The Knights looked strong at their home invitational this past weekend and knocked off the ‘B’ team from the second-ranked squad in NCAA Division II (Grand Valley State). Wartburg dominated the Les Duke Invitational and went from being unranked in the preseason to No. 20. Freshman Sam Pinkowski led the Knights to their second win in as many meets and the rest of the roster packed in well behind him (No. 4, No. 7, No. 11 and No. 16). Rhodes (No. 32 to No. 25), Dickinson (No. 35 to No. 27) and Albion (NR to No. 30) were also big movers in the most recent poll. 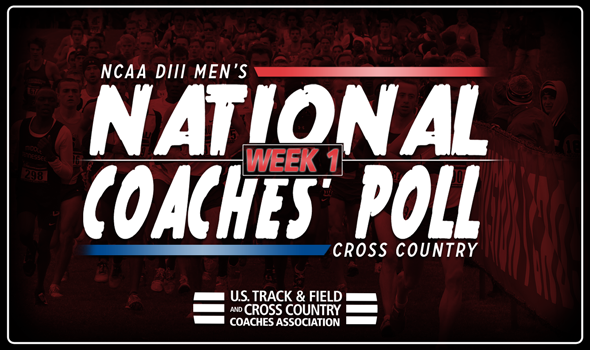 Look for these rankings to change a lot between now and November 14 when the final NCAA Division III Men’s National Coaches’ Poll comes out in advance of the NCAA Division III Cross Country Championships four days later.